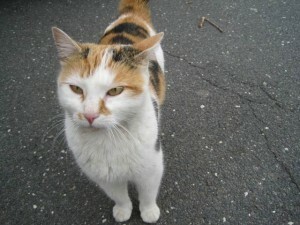 Governors Island in New York recently had a visitor wash up on its shores, a calico cat. Her fur was matted and had seaweed on it. A weekend of storms had preceded her arrival leading many to speculate the feline had been swept into the harbor and then either swam or floated ashore on a piece of debris. It caused a sensation and a name had to be given to this cat (whose owners have not been found). So after a contest where names were submitted—where such names as Mary Ann, Ginger, Salty and Buttermilk were considered—the name that won out was Molly Brown. That’s right. She is named after the “Unsinkable Molly Brown” of Titanic fame. Well you have to admire the selection. From all reports the cat is doing quite well having the island mostly to her itself for the moment. It opens up to tourists on 27 May. No doubt many will ask about the feline Molly Brown, who likely will become a permanent fixture on the island. Titanic Piece Up For Auction-Or Not? On my discussion list I speculated that RMS Titanic Inc. (part of Premiere Exhibitions) likely would be upset and go to court. One of the list participants contacted Premiere and was told discussions were going on, and that the auction house would be making a correction. So far nothing has been released just yet but the obvious question is how Pellegrino acquired this piece. We know Titanic split in two and that there is a debris field between them. Most (but not all) artifacts come from the debris field. Some artifacts were brought up before RMS Titanic Inc (RMSTI) filed for salvage rights (some by RMSTI and the French brought some up as well). So it is possible this piece came up before any salvage rights were awarded. The press release is rather vague about where it was found. It implies it was found away from the debris field which might put it outside of RMSTI’s control. And we do not know who certified it as part of Titanic. It will be interesting to watch how this story unfolds. I am not sure it quite works. Titanic was designed to take damage if one, two, or even three of her forward compartments were damaged from a ship collision. Hitting icebergs were rare (usually head on). Titanic was damaged when the iceberg scraped along the starboard side causing lots of ruptures along the way. Hardly the scenario ever envisioned by ship designers. As for the designer, Thomas Andrews, he perished when Titanic sank. Once again time to see how Titanic gets used and abused as a cliché. -Tracey E. Schelmetic on techzone360.com about Nokia chairman Ollila departing next year. -Daniel Kalinaki writing in Daily Monitor about riots in Uganda and the failure of its television media to cover it.